Best known as the author of Rich Dad, Poor Dad – the bestselling personal finance book of all time – Robert Kiyosaki has challenged and changed the way tens of millions of people around the world think about money. In this new book the bestselling author of “Rich Dad, Poor Dad” confirms his message and challenges readers to change their context and act in a new way. In this timely new book, Robert Kiyosaki takes a new and hard-hitting look at the factors that impact people from all walks of life as they struggle to cope with change and challenges that impact their financial world. In “An Unfair Advantage: The Power of Financial Education”, Robert underscores his messages and challenges readers to change their context and act in a new way. Readers are advised to stop blindly accepting that they are “disadvantaged” people with limited options and challenge the preconception that they will struggle financially all of their lives. Robert’s fresh approach to his time-tested messages includes clear, actionable steps that any individual or family can take, starting with education. Education becomes applied knowledge, a powerful tactic with measurable results. In true “Rich Dad” style, readers will be challenged to understand two points of view, and experience how financial knowledge is their unfair advantage. If you want to know why do the rich get richer even in a financial crisis, then this book is worth you should get. Watch the 6 minutes video below. Click on the play button, allow it to load for a while, pause and allow the video to stream (the light-red colour will get to the end) to the end and play the video so you can enjoy it without breaks. If you really need this book, get Unfair Advantage: The Power of Financial Education on Amazon (The largest global digital products sales store). If you can’t buy the book from Amazon or you do not have the resource to buy it, I can help you out only that you would pay an additional $10 with the price of the book so that I can help you get in 3 – 5 days. If you are really concerned about your financial future, then you need to do something great about your future today. Invest in this book by buying it today, then read it through this week and read and re-read until what is in the book becomes part of you. All the best in your journey to become financially free. For more updates, you should subscribe with your email, RSS, become my friend on Facebook and follow me on Twitter. 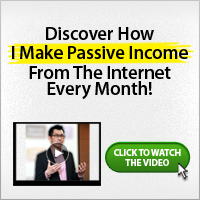 I am here to help you make real money online, build online business and also create wealth.